British politicians are still clinging to antiquated notions of sovereignty, argues Michael Keating. While British governments have in recent decades come to accept the idea of Scottish self-determination, they have not been able to see their way beyond traditional ideas of sovereignty, so that Scotland must be subordinate to Westminster or completely independent. The moderate solution to the problem is rejected while the extreme one is reluctantly accepted. It is not necessary to become an independent state in order to forge a distinct welfare settlement but a new division of competences would be required. There are several ironies in the current constitutional debate in Scotland. One is that both sides are talking the language of union. The label ‘unionist’, previously a highly charged term associated with the Conservative and Unionist Party and loaded with Irish implications, has been embraced by all UK parties, including Labour and (with the occasional qualification) Liberal Democrats. On the nationalist side, Alex Salmond has argued that there are six unions, of which an independent Scotland would keep five (currency, monarchy, society, Europe and defence). Another irony is that, while the Edinburgh agreement and the referendum question excludes ‘third way’ options such as ‘devolution max’, both sides are seeking to position themselves in that very middle ground in the knowledge that occupying it is the key to victory. This is not mere political posturing but reflects a profound truth about modern constitutionalism, that the old sovereign nation-state formula no longer works. We are in an era of ‘post-sovereignty’. This does not mean that sovereignty has disappeared but that in its traditional monist form it is no longer the only principle of political order. More profoundly, sovereignty as a principle is in question. At the supranational level, the European Union has become a legal order in its own right and, within its domain, its laws trump national ones. The only redress to this, recognized in the Lisbon Treaty, is secession – but that option is also open to Scotland within the United Kingdom. Indeed the principle of state sovereignty is also in question domestically. 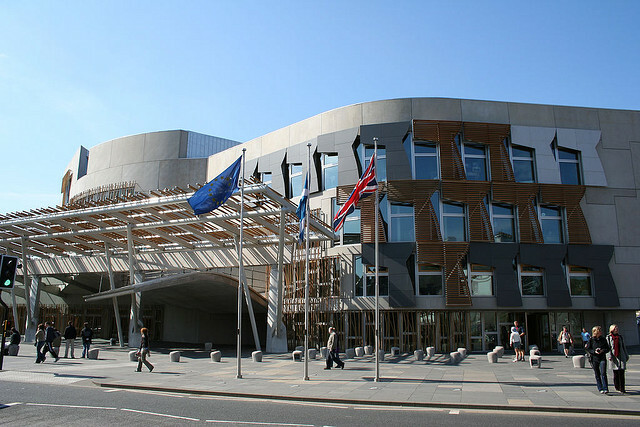 Arguments that the Scottish Parliament is the creation of Westminster, which could abolish it tomorrow, carry little political credibility. Moreover, the issue of sovereignty has never been resolved in Scotland, where Blackstone and Dicey’s ideas have never commanded consensus. The existence of the Scottish Parliament focuses this alternative idea of where sovereignty might lie. Hence there are, and always have been, two interpretations of the union: as the incorporation of Scotland into a sovereign and unitary state; and as a bargain that can be revisited from time to time by either party. Similar arguments exist in Spain and in Canada, although their legal basis is perhaps less developed. In such states, it is futile to seek a single foundational principle to underlie constitutional order and define sovereignty. The endless Canada/Quebec search for a settlement and the current constitutional deadlock between the majorities in Catalonia and Spain show this. The only option is a constitutional pluralism that does not seek to dig down to the foundations all the time but recognizes differences in constitutional traditions and aspirations. The Northern Ireland settlement is a rare example of two states accepting this idea. In recent decades, British governments have come to accept the idea of Scottish self-determination, in a way they did not a hundred years ago in the case of Ireland. John Major, Margaret Thatcher and now David Cameron have reinterpreted the union in this way. On the other hand, they have not been able to see their way beyond traditional ideas of sovereignty, so that Scotland must be subordinate to Westminster or completely independent. So the moderate solution to the problem is rejected while the extreme one is reluctantly accepted. Canada and Spain have similarly missed out on opportunities in the Meech Lake Accord and the revised Catalan Statute of Autonomy because they could not accept even the hint of divided sovereignty. Opinion polls in Scotland have regularly shown a large section of the population (usually a plurality) in favour of extended devolution within the United Kingdom. Since this is almost everyone else’s second option, it would seem to be the basis for achieving the widest degree of consensus (based on necessary compromise if not shared premises). It is true that there is some confusion over exactly what people do want and how much variation in policy they would accept across the United Kingdom, but there seems little appetite for a separate military effort or formal status within the United Nations. On the other hand, there is support for more control over taxation and welfare, the big items of domestic policy not already devolved. This is not surprising. Both economic and welfare policy are rescaling upwards and downwards in Europe so that the nation-state is not the sole level for either or for the social compromises that they embody. This is as true of a potentially independent Scotland as it is for the United Kingdom. Scots do not differ radically from citizens elsewhere in the United Kingdom in their broad preferences for welfare. Public policy, however, does not emerge directly from citizen preferences but from the aggregation and compromise among interests and preferences within political institutions. This has produced a rather different balance within Scotland, notably on matters of universalism and public provision. In the longer run such differences necessarily imply distinct fiscal choices, and indicate the need for mechanisms by which Scotland might recapture the benefits of its own social investments, for example in university education. It also points to changes in the balance of welfare instruments so as to fit local needs and preferences. Measures like the ‘bedroom tax/spare room subsidy’, designed for conditions in the south of England, may have little relevance in Scotland (or in the north of England for that matter). As a matter of functional efficiency, the present division between passive welfare (reserved) and active welfare (largely devolved) creates mismatches and disincentives, which are beginning to be recognized. The location of housing benefit at the same level as responsibility for social housing is one instance. Another matter is the interface among unemployment support and disability support with training, economic development, urban regeneration and social work services. There is never an undisputed optimal level for the integration of public services and the idea of ‘joined-up government’ is often a naïve illusion, but we can probably do a lot better than at present. It is fruitless to design a reformed system of devolution predicated on the present mode of welfare state. One thing that we do know is that the welfare state is going to undergo some major changes, if only for pressing financial reasons. This provides an opportunity to rethink how Scottish welfare might fit into an emerging multilevel model and how resources might most effectively be deployed. It is not necessary to become an independent state in order to forge a distinct welfare settlement but a new division of competences would be required. The nearest comparator would be the province of Quebec which, after repeated efforts to arrive at a constitutional settlement, has engaged in the building of a distinct polity within the Canadian federation and use its extensive taxation and welfare responsibilities to forge a distinct welfare settlement, not radically different from that elsewhere in Canada but sufficiently distinct to have made a real difference in outcomes. In the numerous meetings I attend in Scotland on the constitutional issue, it is these social and economic issues that feature most prominently. It is my belief that Scotland will end up as a kind of post-sovereign polity in a looser union with England and forging its own social compromises within the constraints of markets and wider unions. Our politicians, however, will take us there while denying strenuously that this is what they are doing, and still clinging to antiquated notions of sovereignty. Professor of Politics, Universities of Aberdeen and Edinburgh and Director of ESRC Scottish Centre on Constitutional Change. Scotland is a wonderful country.i like this country. I advocate for a post-sovereignty settlement and, despite having no emotional attachment to the UK state, I would have accepted (and voted for) an imaginative compromise, but that has never been on offer from the UK. A continuing all-island framework along the lines of devo-max but with a thoroughly reformed centre that the constituent countries could directly influence, perhaps through a regionally elected senate to replace the House of Lords alongside a Council of Ministers would have been a start. We could jettison the 18th C. baggage. More imaginatively, Scots would have accepted continuing single UN representation but independent membership of the supra-national EU – in negotiation with other member states. As it is, such options, or even conversations, were utterly rejected in London from 2007 onwards. So, I’ll vote Yes, enthusiastically convinced that the SNP vision of indy-lite is the best realpolitik option. The great problem in this kind of argument, for me, is that it doesn’t acknowledge what we’re giving up under ‘indy-lite’. The SNP’s plans mean we have greater autonomy, but in several key areas we’ll still be effectively tied to decisions made in UK institutions, without any representation within those institutions. Westminster making key decisions for local Scottish communities, without those communities having any representation in the decision-making process, is a major problem from a democratic standpoint. It’s a problem many times larger than the supposed democratic deficit we suffer from now (that simply amounts to saying we don’t like Tories and Tories win half the time). Under the status quo we might not like Conservative governments, but Scottish constituencies have full representation in decision-making. If a particular policy might disadvantage a local constituency, then there is a direct representative from that constituency to argue the case in Westminster – and if necessary mobilise support among other areas in the rest of the UK. After independence, we have no such representation. The only avenue for influencing the decision is through the Scottish government via external negotiations – a strategy that is both incredibly difficult to achieve given the disparity in size between Scotland/rUK, and is also premised on the idea that all Scottish local constituencies agree on every issue (when clearly they don’t). If a constituency happens to be in the minority on a particular issue in Scotland then there is no representation for that constituency at the UK level, given the Scottish government will negotiate from the majority view among Scottish constituencies. That’s why there’s a very real case for saying devo max, full independence, or nothing. Devo max means an incremental increase in our autonomy while still retaining all of the representation we have in UK decision-making. Independence-lite means gaining some autonomy, while losing all of our representation in UK decision-making. As far as I’m concerned, that’s the worst compromise of all.